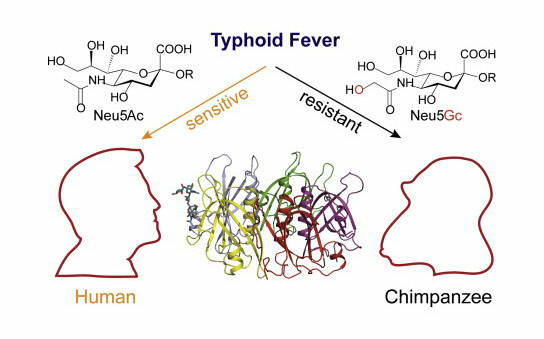 Due to a single oxygen atom difference in sialic acids, typhoid toxin affects humans while other mammals are resistant. Scientists at Yale and UC San Diego have discovered why typhoid toxin targets only humans, revealing a single oxygen atom is the cause. The bacterium Salmonella Typhi causes typhoid fever in humans, but leaves other mammals unaffected. Researchers at University of California, San Diego and Yale University Schools of Medicine now offer one explanation — CMAH, an enzyme that humans lack. Without this enzyme, a toxin deployed by the bacteria is much better able to bind and enter human cells, making us sick. The study is published in the December 4 issue of Cell. In most mammals (including our closest evolutionary cousins, the great apes), the CMAH enzyme reconfigures the sugar molecules found on these animals’ cell surfaces into a form that the typhoid toxin cannot bind. Humans don’t produce CMAH, meaning our cell surface sugars are left unchanged — and as this study shows, in a state just right for typhoid toxin attachment. “We started this project looking at something completely different in relation to cancer, but serendipity instead helped us solve the mystery of what the typhoid toxin binds,” said co-senior author Ajit Varki, MD, Distinguished Professor in the Departments of Medicine and Cellular and Molecular Medicine at UC San Diego. “That’s the beauty of basic research — though we didn’t set out with the intent, these findings may now spur the development of new therapies for typhoid fever.” Varki co-directed the study with Jorge E. Galán, PhD, DVM, professor and department chair at Yale University School of Medicine. All mammals decorate their cell surfaces with a type of sialic acid sugar called Neu5Ac. In most mammals, the enzyme CMAH coverts Neu5Ac to Neu5Gc, a subtle but important distinction involving a single oxygen atom. Varki, Galán and their teams are the first to discover that typhoid toxin binding is exquisitely specific for Neu5Ac (the human type). The toxin damages cells expressing Neu5Ac sugars on their surface, but not those with Neu5Gc (the non-human type). In fact, when the researchers added Neu5Gc to cultured human cells, they became resistant to typhoid toxin. The findings were confirmed in a mouse model. “We have previously shown that typhoid toxin can cause typhoid fever in experimental animals and that to intoxicate cells, the toxin must bind specific surface glycoproteins. The discovery that a single oxygen atom could make such a difference in toxin binding is remarkable and has implications for the design of potential toxin inhibitors,” said Galán. Typhoid is typically transmitted through food or water contaminated by infected people. While hand washing and other sanitary measures have minimized occurrences of typhoid fever in the U.S., roughly 21 million cases of typhoid fever and 200,000 deaths occur worldwide each year, according to the Centers for Disease Control and Prevention. Co-authors include Lingquan Deng, Nissi Varki, Yuko Naito-Matsui, UC San Diego School of Medicine; Jeongmin Song, Xiang Gao, Yale University School of Medicine; Jiawei Wang, Tsinghua University; Hai Yu, Xi Chen, University of California, Davis. This research was funded, in part, by the National Cancer Institute (grant CA38701) and the National Institute of Allergy and Infectious Diseases (grant AI079022), both part of the U.S. National Institutes of Health. Image: Lingquan Deng, et al. Be the first to comment on "New Research Details Why Typhoid Toxin Targets Only Humans"